That firearm suicides outnumbered firearm homicides doesn’t surprise Matthew Miller, who studies suicide at the Harvard Injury Control Research Center. Suicide rates have been higher than homicide rates for as long as Miller remembers, but many people still assume they are more likely to die in a mass shooting than they are by shooting themselves, he said. Living with a gun in the home makes residents more likely to die from suicide, because they’re more likely to attempt suicide using a gun — and with guns, there’s no turning back, Miller said. The public doesn’t hear about firearm suicides often because of the stigma surrounding suicide and people who kill themselves, he said. “I think what we see in the media, whether it’s newspapers or television or movies, there have been people shooting at one another with guns, but rarely do you hear information about suicide,” Miller said. Safe-storage laws are among the few measures suicide analysts agree could help lower firearm suicide rates, because they put a buffer between the mental impulse to end one’s life and the firearms available, Berman said. “The problem of course is the NRA (National Rifle Association) and their interpretation that any attempt even to talk about safe storage is the beginning of gun control,” Berman said. Legislation isn’t necessary to promote gun safety, said Don Turner, Nevada Firearms Coalition president. Nationally, firearm suicide rates haven’t changed much over the past 20 years that Berman has studied them. However, some states with prevention programs have had success in lowering rates, he said. It’s not unusual for suicidal people to make several plans or attempts to kill themselves, but experts are noticing a trend of more impulsive suicides with firearms, she said. A survey showed 47 percent of people who attempted suicide did so within 10 minutes of thinking about it, she said. His 18-year-old son grabbed a Smith & Wesson handgun from a knapsack in his parents’ closet and shot himself in the shower. In his suicide note, Levi Johnson said he would’ve killed himself regardless of the means. The note he left behind took fault with his brief time in the Marines and told his Mom not to blame his Dad for the gun, because if the gun hadn’t been available he would have just used a knife or something else. It was the second time Johnson’s son tried to kill himself. During basic training, he tried to overdose on aspirin. In high school, he had a history of cutting himself. 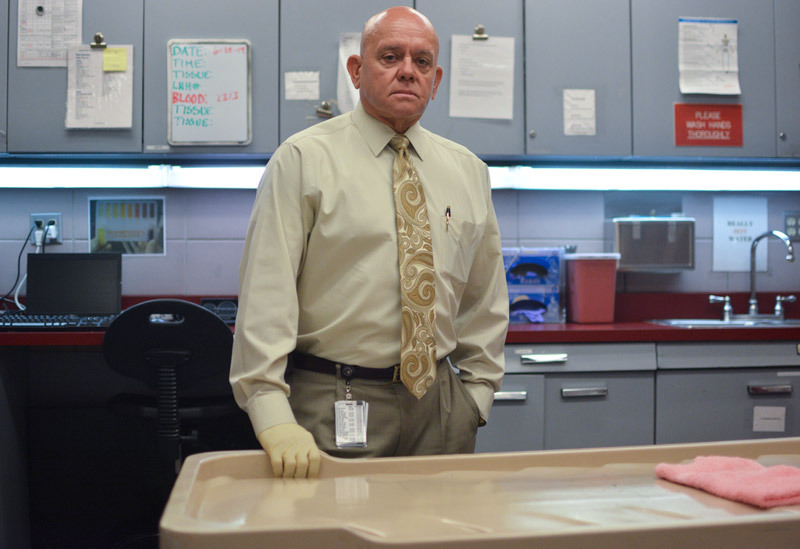 Clark County Coroner Michael Murphy stands in one of the receiving rooms of his office on July 2, 2014. Photo by Jacob Byk/News21. Clark County coroner Michael Murphy spends time helping Las Vegas-area families cope after they lose a loved one to suicide. He can’t provide much solace because he can only tell a family how their loved one committed suicide, but not why — the burning question for most. Regardless of the means, suicide is a mental health issue to Murphy. The solution is increasing awareness of the problem and treating it as such, he said. It’s difficult to know what prevention practices work best because statistically, it’s hard to measure what hasn’t happened, Murphy said. Egan took the Office of Suicide Prevention job after a long Air Force career. He regularly staffs the office’s booth at gun shows to talk to people about firearm safety and suicide. Within five days of each other in 2009, three individuals walked into Riley’s Sport Shop in Hooksett, New Hampshire, and bought firearms they used to kill themselves hours later. Elaine Frank, creator of the New Hampshire Firearm Safety Coalition — of which the sport shop was a member — worked together with the owner of Riley’s to create the Gun Shop Project. Suicide is preventable up to a point, Frank said. But there will always be a few individuals who give no warning and will end their lives by any means available. “There are many people who are suicidally ambivalent. They’re not sure that they want to live, but they’re really not sure they want to die,” Frank said. Smallwood hasn’t yet been through the training, but after knowing four people who committed suicide — including his best friend — he feels like he can recognize the signs. Smallwood was in Washington, D.C., when he got a 1 a.m. call about his best friend’s suicide. He was on the first plane home to Las Vegas to be there for Danny Wortman’s wife and family. Wortman came home and went upstairs for a long period of time, Smallwood said. When his wife went to the bedroom to check on him, she found him with a revolver to his head. She screamed “What are you doing?” and tried to pull the gun away. “Going through so many (suicides) and going through what I did, I pretty much know what to look for,” Smallwood said. For gun shop employees who haven’t experienced suicides, it’s important to know how to recognize warning signs, he said. “It’s something everybody in the building watches out for,” he said. Employees know it’s a red flag when a customer asks to rent a gun but doesn’t care what kind. When they only ask for one or two bullets, employees know to be cautious, Smallwood said. That’s when a counter employee will call over Smallwood or another manager for a second opinion. If a manager feels uncomfortable giving the person a gun, service will be denied. Smallwood keeps a stack of brochures and phone numbers in his office he can give to people who seem to need help. 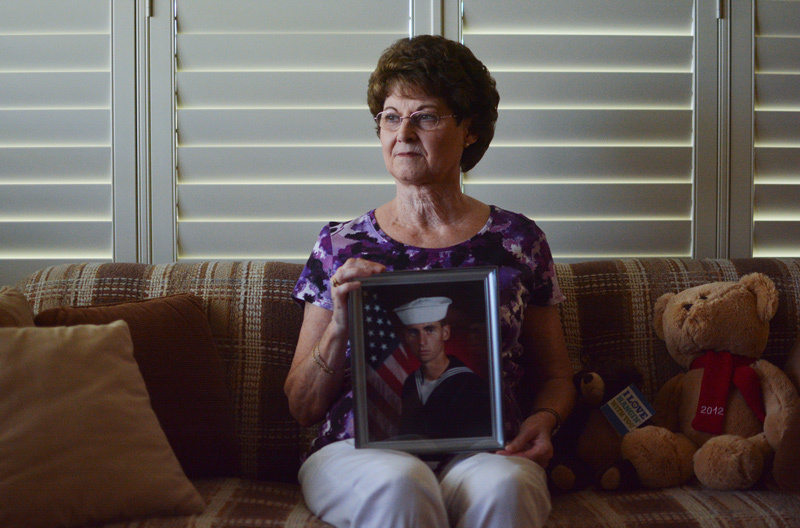 Linda Flatt's son, Paul Tillander, killed himself in 1993. After his death, Flatt helped found the Nevada Suicide Prevention Office at the state Division of Public and Behavioral Health. She partners with gun stores, ranges and shows to make gun owners more aware of firearm suicide. Photo by Jacob Byk/News21. Before the office was created in 2003, Sen. Ann O’Connell, R-Las Vegas, who sponsored legislation Flatt worked on, told her any mention of gun safety or gun control paired with suicide prevention talk would kill any progress for help to curb suicides. After her 25-year-old son, Paul Tillander, committed suicide in 1993, Flatt was adamant in thinking suicides were unpreventable. More than a decade later, she’s convinced the creation of the Office of Suicide Prevention and its work have helped decrease the high rate of suicide in the state. Carmen Forman is an Ethics and Excellence in Journalism Foundation News21 Fellow.